Lulu and I in the kitchen, it’s a scene. She likes to sit on the floor at one corner of the room with pots and pans and muffin molds to play with while I’m busy at the sink and stove. Cooking. We both make a mess in our own way. Occasionally, she looks up at me to make sure that I am still there, within reach, before she concentrates again on her imaginary cooking game. Then, when she is done, she walks to me, pulling on my dress so that I carry her. She wants to see what I’m doing. What I’m cooking. It’s funny because right now, my kitchen is not the most inviting room in the house with boxes piled everywhere, yet Lulu and I don’t seem to take notice of the untidy space. Every day, we end up liking to spend time in the kitchen. Playing and cooking together. When I became a mother, I didn’t know anything about introducing food to a baby. I didn’t know what Lulu would love and what she’d refuse to eat, and how I would end up dealing with it. I was unaware, too, of the challenges this natural process would keep along the way. But Lulu likes to eat. I like to think that she must remember when I used to tell her stories about the good foods we were having when she was still in my belly. Watching her eat joyfully makes me feel warm inside. Every single time. Just as my mother did, I want to educate Lulu to the art of homemade foods. We walk to farmer markets together where I name to her all of the foods we like to eat; I have her smell fresh herbs and notice the beautiful colors of vegetables and fruit; I teach her how to use my Peugeot pepper mill to season rice and vegetable stews–one of her favorite foods by far. And I show her how to hold the spoon. And stir. She loves to stir. And help. The other day, it’s stewed berries that we prepared together. She kept going for the spoon I had put inside the pot. So I let her do it. And I helped, discreetly, whenever I was needed. It made me feel proud. I was proud of her. When the berry sauce was ready, I looked at the jar, imagining how tasty it would be with a bowl of plain yogurt. Then, I imagined berry parfaits. I wanted something delicious and healthy; I wanted to show her about a beautiful food we’d be able to eat for breakfast, or as a midday snack. And I told her a story about it. To build a strong memory of our time in the kitchen. Mother and daughter cooking together. Tomorrow, I am taking Lulu to France again. I wonder what new foods she will be discovering this time. A bientôt…I will have pictures, stories and foods to share. To make the sauce: In a pot, combine the berries with the sugar, vanilla bean and seeds. Bring to a simmer and stew for 5 minutes, or until the fruit is soft and has released its juice. Stop the heat, discard the vanilla bean and transfer the berries to the bowl of a food processor. Purée and strain. Set aside to cool. Refrigerate until ready to use. 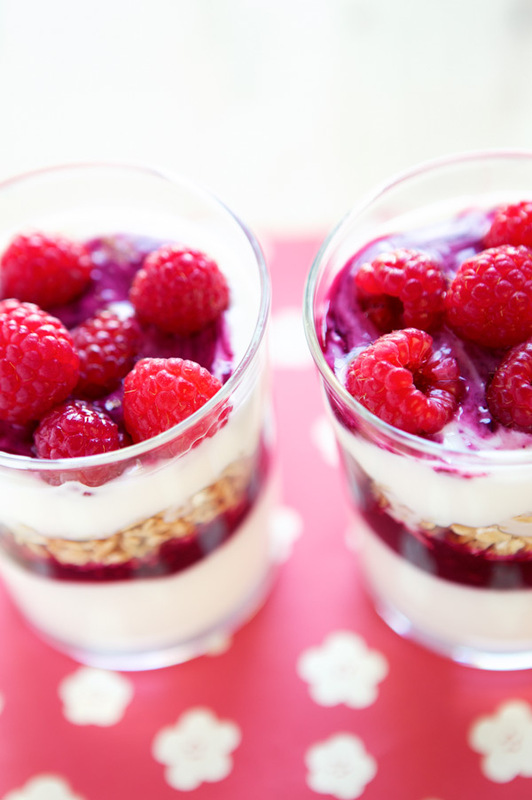 When you are ready to serve, take a few small glasses and start to layer the foods as follows: yogurt, berry sauce, granola, yogurt, berry sauce and fresh raspberries. To have a taste all of the different layers with a spoonful, I suggest stirring lightly when eating. This is a wonderful food to have for breakfast or as a midday snack. What a beautiful, beautiful post! I loved reading this. It is such a gift knowing how to cook. And it’s inspiring to be able to see it be passed down. I’m sure one day your daughter will look back on her kitchen experiences and realize they were priceless. Lovely. Ta fille est tres mignonne! Est les photos! Elles sont si belles. La France me manque toujours, particulierement la cuisine. Amusez-vous bien, vous deux! I hope you have a wonderful time in France. This is such a wonderful post reflecting on how a mother and daughter bonds in the kitchen. It’s so beautiful to think that Lulu could remember the foods that you enjoyed while pregnant. I can tell she is going to be quite a discerning foodie. so wonderful bea.i can only imagine what it must feel like to share such moments with a daughter and at the same recollect your own child hood. have a safe and wonderful trip! I always look forward to your posts. This is such a beautiful story accompanied by the loveliest photos. 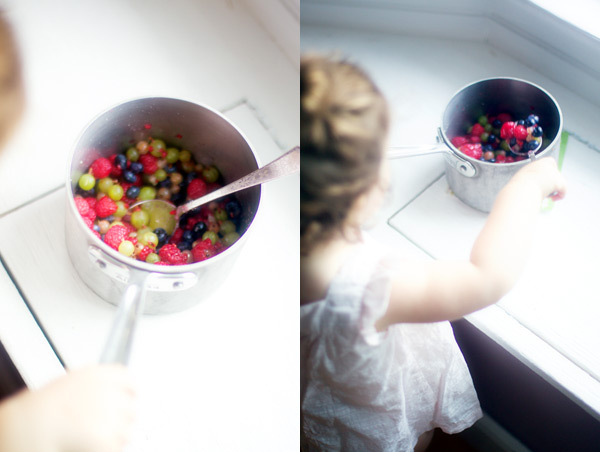 Lulu is quite the little helper, stirring the berries and all, and you illustrate it so well. Have a wonderful trip! Beautiful photos! I envy your trip to France together. I adore cooking with my son – I hope he grows up with the same great memories of our kitchen. I love the photo of y’all walking, both wearing similar outfits. A perfect mother and daughter moment! There is nothing more precious than the moments we share with our children. Thank you for allowing us into your joyous days with Lulu! Safe trip to you and the family!! What a wonderful set of traditions you are creating with Lulu. Have a wonderful time in France! And perhaps when you start unpacking those boxes and organizing all of your kitchen things/props, you can write a post about it! I’m still dying to hear more about your ever-changing kitchenware! Bon voyage! 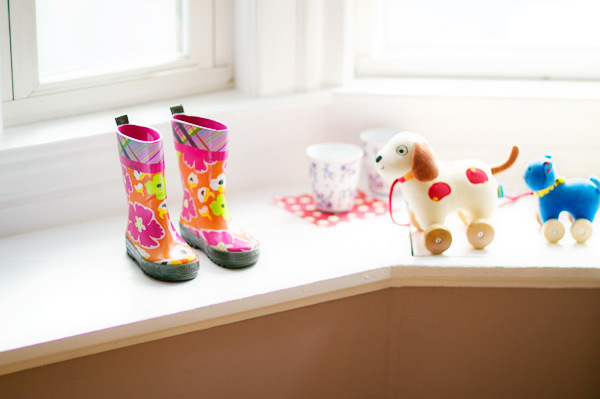 The photos of the toys and Lulu on the floor are wonderful. Can’t wait for more France photos. such a cute story and photos. can’t wait to see photos from france. your daughter helping in the kitchen is cute! 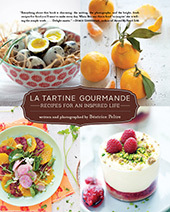 I love this recipe,thanks for sharing..
Gorgeous story and photos, as usual. Hope you both have a wonderful trip! Lovely post, thank you!…Have a great time in France! I LOVE this post! Beautiful story & photos. Bon voyage! how lovely! it must be a great time! Such a lovely post, thank you for sharing this. I try to encourage my daugther to engage in my cooking to, I think it does form a basis for some great childhood memories. Lulu will happy to playing around under the ‘mirabelle’ trees coz its season now in Lorraine -as u knows,Bea. Bon voyages! La Tartine Gourmande est un plaisir délicieux. J’ai toujours un sourire aux lèvres en voyant qu’il y a un mél de vous et de nouvelles photos, recettes et histoires à découvrir. Non seulement vos plats sont exquis, mais vos histoires de Lulu et vous m’enchantent. Ma Claire et mon Julien ne sont plus petits, mais ils ont grandi dans la cuisine et au marché avec moi et sont à la fois gourmands, gourmets, et adorent faire la cuisine. Je suis parfois réveillée à 3h du matin par les parfums de morilles sautées avec de l’ail…je sais que je leur ai bien appris…Bonnes vacances en France ! We are introducing solids to my son for the first time this week on his six month birthday. As I am the cook in the family, I have been trying to do the same thing. While being held by my wife he has already been imitating me as I chopped vegetables. Hopefully he will turn out to be the little helper that Lulu is. Oh Bea, I love the last photo of the two of you walking away. (I also admire you for the way you share your daughter on the blog in a way that protects her privacy and doesn’t exploit her.) Lovely photos! What a gorgeous post! Your photos are always so inspiring and lovely. You capture the moments that deserve a photograph. Thank you for sharing such beauty with the rest of us and have fun in France with Lulu! Cant wait to see more photos of France when you return. Magnifique article. Ta fille se rappellera de toutes ces saveurs que tu lui fais découvrir, elle a beaucoup de chance ! Hope you have a great time in France. Your article is really beautiful. Such a sweet story. It is so deeply rewarding to feed people, especially the little ones – I know what you mean when you say you feel warm inside, even if I don’t have children yet. I actually feel a little warm even when I feed my cats, and I don’t even cook for them! Have a great time in France! si belle, bea! lulu is a lucky girl to have a mama like you! xo. Every single photo is wonderful, but the last one is pure poetry! A lovely post Bea. It brought back wonderful memories of my time in the kitchen with my boys – who have both turned out to be great cooks, although in different directions. The eldest is into Asian and the younger Mediterranean. what a wonderful post my friend! have a wonderful time in France with that sweet chickadee and I can not wait to see your photos when you return! Each and every time I read your posts and see the images I get inspired by the LOVE you share!!!! !Thank you for allowing us into your joyous and LIVE days with Lulu! Enjoy your trip to FRANCE !! You’re so talented. Keep well. Cooking is such an intimate sensory experience, and I love hearing stories of how you involve Lulu in it! So often I think parents want to avoid the mess and extra time that are inevitably part of cooking with kids, and in the process lose out on this valuable bonding and teaching time. You set a good example. Have a wonderful trip – I can’t wait to see the photos! Thank you for sharing such beautiful mum-daughter moments with your readers. My toddler has found her own place in the kitchen too. Your post has inspired me to set aside some margin time, so I can involve her as i cook. Enjoy your trip to France. I am sure she will make amazing discoveries in the markets of France! My own memories of the farmer’s markets in Alsace are brimming with colours and smells and incredible noises! Beautiful. When I have my own kid, I’ll do the same. Thank you for sharing. I know this feeling, only for me it’s two little twin boys who roll, knead, stir, whisk, weigh and sniff. 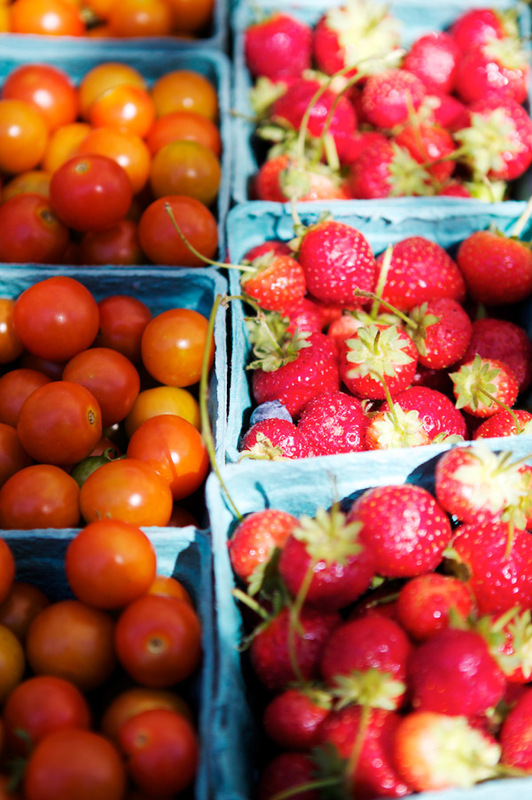 We pick blueberries, visit goats, gather eggs on chicken farms and weigh produce in the store. It’s the best time in the world. You are so fortunate to be able to take her to France and further enrich this kind of time together. May you be blessed greatly on your trip. Lulu is a very lucky little girl, she has an extrordinary mother. Have a wonderful trip. What a gorgeous picture of the two of you at the end! I love it. Ah tu en revais, de ta petite marmitonne 🙂 qu’est-ce qu’elle a grandi deja. Je suis certaine que tu sauras transmettre, je peux t’assurer que ca marche. Have fun! what a beautiful post. have a fabulous time! This post is precious. You’re very lucky to have each other. It’s wonderful that you cherish the beautiful moments. What an amazing narrative and rich flowetry you have in visuals!! I really love your pics and the how you’ve combined it into a really beautiful post. SO warm and inviting. Thank you!! what a beautiful post! very inspiring. when I was little I would sit on the kitchen counter and sing while my mom cooked. so many wonderful memories! What a lovely post Béa! Precious moments in the kitchen. Is there a more wonderful thing than sharing food and tradition with your loved ones? Creating so many memories. Sharing all your love and passion. Have a safe trip to France. Enjoy! I don’t have children, but I hope that when I do they are not fussy. I would find that so hard! I think that parents can influence this to a certain degree by encouraging children to eat anything and everything from a very young age, before they have a chance to learn bad habits from other kids. Indeed, the only people I know who are really fussy in their adulthood had parents who let them eat dessert instead of dinner to stop them winging; never a good idea! 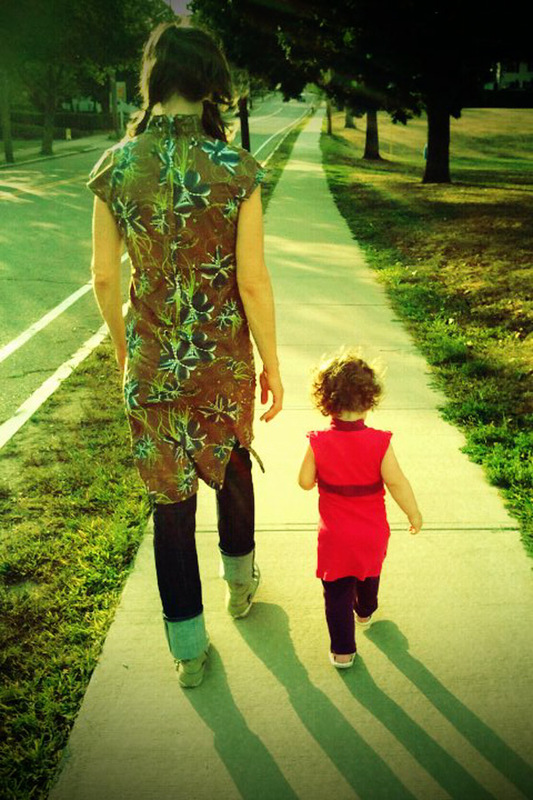 Beautiful Lulu and a beautiful Mama … and a post as beautiful! I am a big supporter of having children help in the kitchen. If they cook some food they don’t know, they’ll be more willing to try it out! The pictures are beautiful. Bon Voyage! Your photos are so beautiful. So soft and evocative. Care to tell what camera you use? Good luck on your trip! Quelle évasion à travers ces photos! C’est un vrai moment de paix et les couleurs sont formidables! Lulu a de la chance de goûter tant de saveurs et de choses, elle aura un goût affuté pour sûr! Et déjà en triain d’aider à la cuisine c’est un début! I do love reading your posts. I am really looking forward to seeing your pics from France….I hope to one day take my little girl there too. I understand your joy in sharing her experience with food. have a wonderful time with your family in France. your blog posts are always so beautiful, and very restful on the eyes! aw, that is darling. i love all the bright berries in the pot, and i love the last photo of mother and daughter walking together. beautiful! I was just heralded back to a time in my kitchen when two young children stirred and tasted. 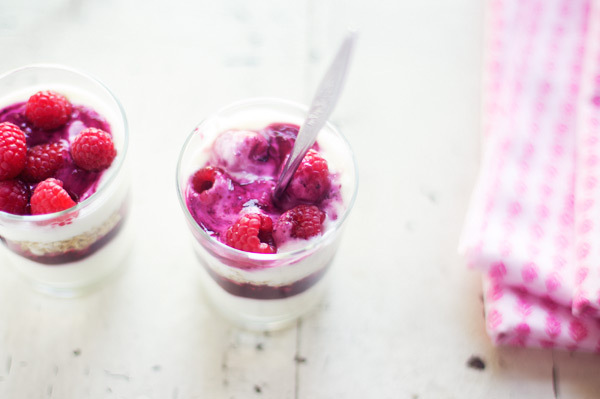 The parfaits are gorgeous – the memories are forever. WOW this is such a warm post. I want to do all these things when I have a baby. Beautiful story. It’s so nice to hear about how you teach your daughter to love and enjoy food, developing a healthy, nurturing relationship with it that she will remember. It’s such an important lesson and you have lovely photographs to show for all the fun you two have together. What a beautiful story. Every time I visit your blog I feel a kind of peace everywhere. 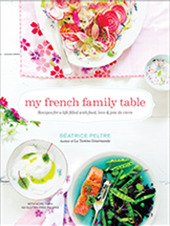 Lately some of my readers haven asked me what person I would like to meet and I always answer: Beatrice Peltre. Thanks to share your stories, your lovely pictures, your life style and all this calm atmosphere. I am so excited for all your pictures! They remind me of such a pretty pink birthday party. perfect for cooking with ma. I love this blog.. it’s telling a great story. What a beautiful beautiful blog. Your pictures are stunning, your writing beautiful and moving. I’m sad I am just discovering it now! I too feel that the greatest joy of parenting my two young daughters, is in educating them on the miracle that our food grows, that we can use our hands to make beautiful things, and that gratitude is essential to a happy life. 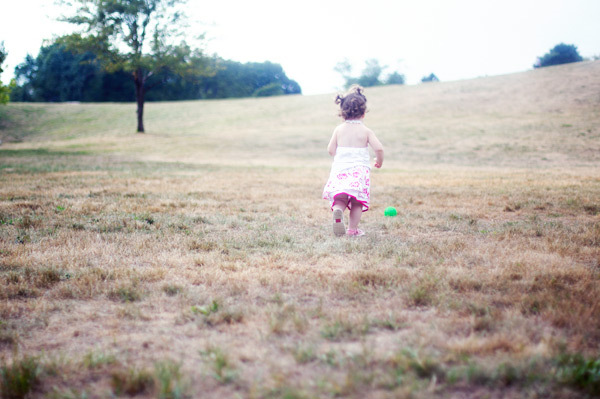 Loved reading this post Bea! I am also trying to “introduce” my daughter to the kitchen, talking to her as I cook, making her smell the different herbs…you are truly an inspiration! Lovely photos. Lovely post. You inspire. Absolutely delightful! Your relationship with your daughter seems wonderful and I’m sure she will cherish those memories. That’s a very lovely story! I hope Lulu will grow up to be passionate about food and cooking. Best wishes to you both! Hi! What a great post! I have 2 girls who also love to “help” me in the kitchen. At first, I got frustrated with the mess that they made. Then my mom reminded me that these are the moments that my children (and I) will remember. So, I’ve learned to relax about it. On a side note, I REALLY love those rainboots!! Where did you get them?? You are a natural. Your daughter, so lucky. Teaching is such a rare, precious talent. This post is really nice, I never thought of such things, this is sweet. The pictures looks nice too. Your girl, you really should show us her face, she must be very cute. By the way, I have site about coffee, if you have time, you can visit it. I think this is one of my favorite posts from you… I am inspired on how you do things so easy and very meaningful. You daughters seem a sweet kid and I am sure she is grateful to have you as her mother. I just hope you really share the kitchen cooking real food together. I think that would be great. It is so beautiful you have your daughter helping you. I love the natural foods you are using.